EUGENE, Ore. – If ever there was a game that epitomized the “tale of two halves” cliché, it was this one. In the Huskers’ 42-35 loss to Oregon (2-0) on the road, the Nebraska (1-1) defense was, again, one of the biggest storylines of the game. The Blackshirts surrendered more than 400 yards and 42 points to the Ducks in one half of play, and entered halftime licking their wounds down by four scores. Nebraska’s defensive coordinator, Bob Diaco, hadn’t even made it to the locker room at halftime, though, before the speeches started. Safety Joshua Kalu, who left the game before the break with a hamstring injury, tried to encourage the defense. Nose tackle Mick Stoltenberg shared some words. So did left guard Jerald Foster. But linebacker Luke Gifford had the one that got the Huskers going. Gifford, who finished off another strong game with five tackles despite being listed as a reserve linebacker, said it was about going out and showing some pride in who they are and what they represent as Nebraska football players. “We were just preaching that we were going to play with pride and we weren’t going to give up, we’re not a team that’s just going to lay down and take a beating,” Gifford said. “We’ve got to remember who we play for. We’re down 42-14 and we’re wearing an ‘N’ on the side of our helmet. At that point it’s like, alright, we need to have some pride and play hard and represent the state and ourselves, our brothers." We’re down 42-14 and we’re wearing an ‘N’ on the side of our helmet. At that point it’s like, alright, we need to have some pride and play hard and represent the state and ourselves, our brothers. When the second half kicked off, the defense looked like a completely different unit. The Huskers blanked the Ducks after the half and gave up just 157 yards of total offense. They forced a three turnovers, cut the Ducks' yards-per-play average almost in half (9.1 down to 4.9) and got every stop they needed to give Nebraska a chance to tie things up right at the very end. A late interception from quarterback Tanner Lee slammed the door on a comeback, but the defense did its part. For the second straight game, the Huskers controlled the third quarter. Nebraska has now outscored its opponents 21-0 in that frame on the season, and that starts with adjustments made by the staff at halftime. For the second straight game, Nebraska’s halftime adjustments on defense worked, too. Jackson said corners were freed up a bit more to play zone and stray away from one-on-one man coverage every down. Guys were able to try and make plays, like the interception from safety Aaron Williams. In the run-up to the season, Diaco stressed that this defense – transitioning to a new style without the necessary recruiting – would be a process. He said the same again Saturday night. The staff was “disappointed in the results,” and said they just can’t start a game the way they did, but there were still positives to take from the fight the defense showed after the break. Barry praised the coaching staff's approach to the second half, and the staff praised the players. Still, football isn’t a game of moral victories. 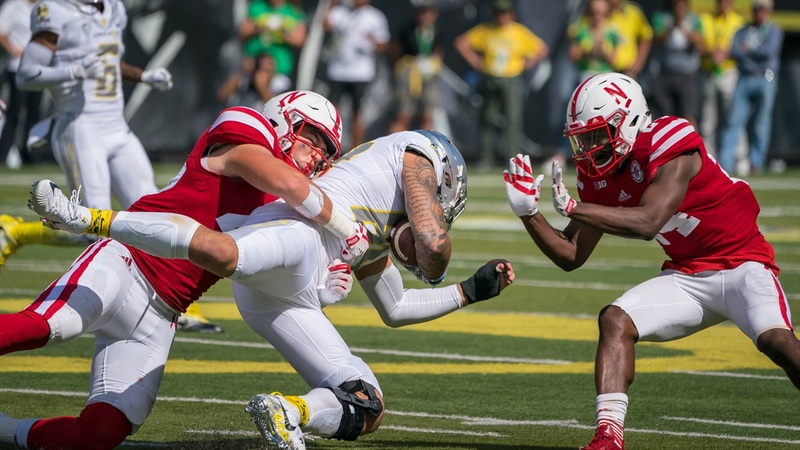 Players and coaches are ultimately judged on the scoreboar and the Huskers came up on the short end of it against the Ducks Saturday. There are still things to worry about from a defensive standpoint, but in front of what seemed like an entire end zone of Nebraska red, the Huskers tried to salvage what they could from a horrific start and play for pride.